This charming northwoods styled home is fully furnished and decorated with a mountain motif. 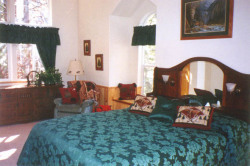 Our home can sleep up to eighteen people and works nicely with two, or possibly three families. It is located on a quiet private street. This is a three level home that features a huge great room and master bedroom, both with 22 foot cathedral ceilings. There are four bedrooms, three and a half baths, a loft, a dining area, a family room, laundry and a fully equipped kitchen with knotty pine cabinets and upgraded appliances. There are three decks, two of which overlook a greenbelt with trees and a meadow behind the house, and a third deck off the master bedroom. You'll enjoy reading by the large bay of 20 foot high windows in the expansive great room with a gas thermostatically controlled fireplace. 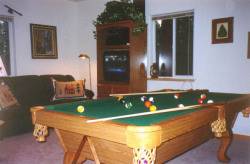 The great room features a 32" TV with a DVD player, VCR, and a CD player. If it gets noisy, you can send the kids downstairs to the family room to play board games, watch TV, or shoot a game of pool. 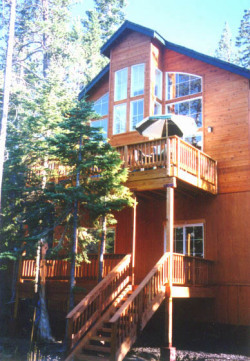 Located in North Lake Tahoe's exclusive "Tahoe Donner" area, the home is close to both winter and summer activities. Nationally acclaimed cross country and alpine skiing are minutes away. Two lakes are nearby with their many associated water activities and beaches. Several eighteen-hole golf courses are in the area, two are within a five minute drive. Trails for hiking, mountain biking, and horseback riding are all nearby. 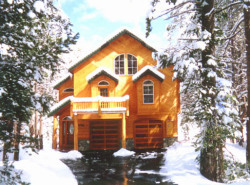 Reno casinos, shopping, and night life are thirty minutes from our Tahoe Donner home. Balance to be paid - 3 weeks prior to arr to arrival.